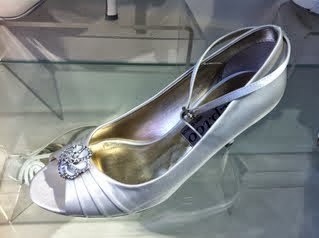 Bridal shoes should be a synch to cross off your to do list - right? Wrong! I've been hearing all sorts of horrible stories about how hard it has been for brides to find a pair of wedding shoes. Why? Because white and elegant strappy shoes are out of fashion right now - chunky straps are in. And whilst they may look hot on a nightclub dance floor, they aren't the right look for a wedding dress. I've put this post together for you to help make finding your splendid shoes just a little easier. Have you discovered Pinterest yet? If not then we suggest you hop on over to http://pinterest.com/and check it out as it will revolutionize the way you are researching ideas for your wedding. It doesn’t matter if you are just starting out, or only have a few tasks left – Pinterest will be able to help. And it is all free! And free is a word we brides-to-be love to hear as we watch the costs for our wedding tally up!